Sucker fish are also known as pleco, or plecostomus. It may be one of multiple species of catfish including the sucker mouth catfish (Hypostomus plecostomus). 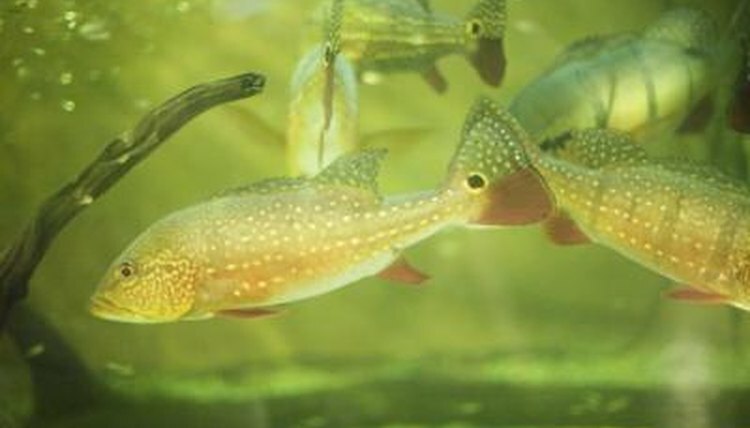 Sucker fish are nocturnal and as commonly thought of as algae eaters, although they should be fed a more well-rounded diet. Sucker fish are omnivores and will eat much more than just algae. They can help clean up algae created by other fish, but the amount in a normal aquarium may not be enough for them and it may not be nutritionally balanced. Sucker fish food can be supplemented with algae wafers. Fresh veggies can be given to your sucker fish, including lettuce, squash and cucumbers. Sucker fish also should receive meaty sustenance, such as pieces of shrimp or fish fillets. When feeding your sucker fish flakes or tablets with other fish in the tank, make sure you feed enough. Because they are nocturnal and often slower swimmers, they may not eat enough. Sucker fish also need wood -- typically driftwood -- in the tank to chew on, to get fiber.